Tartar Sauce: Stir together mayonnaise, pickles, mustard, lemon juice, shallot, salt and pepper. Cover and refrigerate for at least 30 minutes until chilled or for up to 1 week. Place griddle plates on the grill. Use switch at bottom right rear of grill to make flat surface. Close cover; set cooking temperature at 400°F and cooking time for 10 minutes. Allow grill to preheat for 5 minutes. Stir together 1/2 cup of the bread crumbs, mayonnaise, parsley, green onions, mustard, lemon juice and Worcestershire sauce. Crumble in crabmeat; stir to combine. Shape into 8 balls and press into 1/2-inch patties. Place remaining bread crumbs in a shallow dish. Carefully press each patty into crumbs to coat. Brush lightly with oil; grill, turning once, for 10 minutes or until golden brown on the outside and heated though. Serve with tartar sauce. Tip: Extra tartar sauce can be served with grilled fish fillets or mixed with canned tuna for a quick sandwich filling. For the Indoor/Outdoor Grill: preheat grill to setting 3 and cook covered for 3 minutes per side. 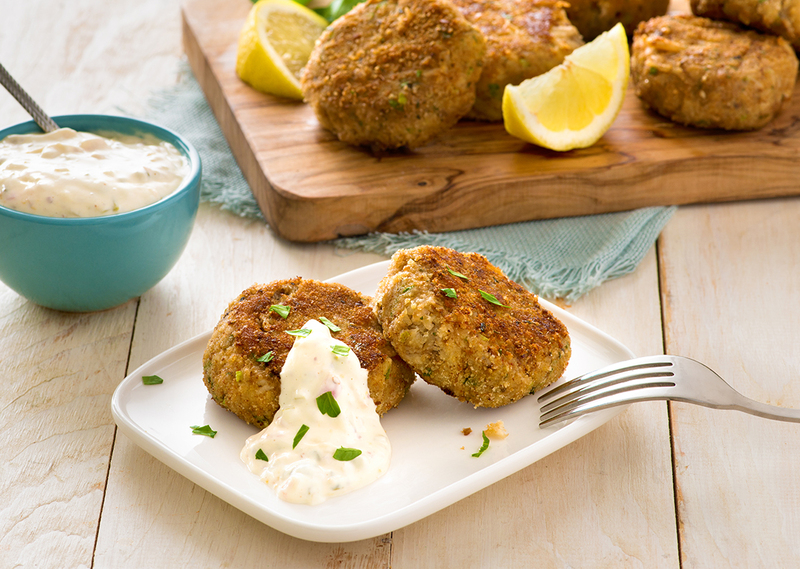 For Classic Plate Grill: preheat the grill, and cook crab cakes for 4-5 minutes.